BEIJING, June 26, 2018 /PRNewswire/ -- Elion Group and BP deepened their partnership by signing a carbon emission purchase contract in Beijing, for Chinese Certified Emissions Reductions (CCERs) from the forestry sector. Through the purchase of CCERS, BP will support the existing carbon stocks on nearly 1,400km2 of desert oasis in the Inner Mongolia Kubuqi Desert. This agreement will also provide further support to Elion to further develop projects on ecological restoration in China. 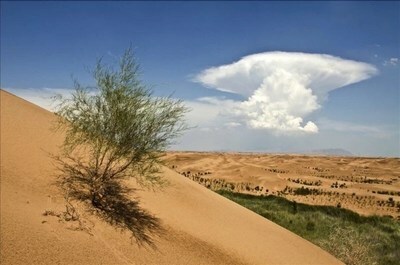 The Kubuqi desert, the 7th largest desert in China, is 800km away from Beijing. To date, Elion has devoted 30 years to the restoration of Kubuqi's ecosystem and has undertaken a series of China's national eco-projects, including the Three-North Shelter Forest Program and the 2022 Beijing Winter Olympics project, while expanding its business in Belt and Road countries. "Elion, as a leading Eco-company in China, has developed the internationally recognized Kubuqi Model, which combines the support of government policies and the investment of private sectors," said Wang Wen Biao, Chairman of Elion Group. "I see it as a platform to attract business partners worldwide to participate in Chinese markets." "Our growing global environmental products business is investing in high-quality carbon offset projects worldwide," said Dr Janet Kong, CEO Eastern Hemisphere, BP Supply and Trading. "BP has been actively participating in emissions trading in China since inception. We see its carbon markets continuing to grow and playing a more important role in emissions trading in the future. Through leveraging our global experience and industrial insights, we plan to continue to support customised carbon asset management to our Chinese partners, such as Elion as they pursue environmental and sustainable development." Elion is helping to accelerate the development of China's green finance, through the design and deployment of tools to help promote social capital investment into local environmental projects. This new collaborative effort between Elion and BP showcases how highly innovative commercial arrangements help support the development of this industry. Through its investment in projects that reduce emissions and generate environment credits, BP's Global Environmental Products business uses these environmental credits in carbon pricing systems around the world. "The partnership between BP and Elion provides an exciting platform for both parties to further contribute to the development of China's emission reduction programs," Dr Xiaoping Yang, President of BP China, stated. "As a trusted energy partner, BP is committed to participating in China's energy transition to a lower carbon future by promoting technological innovation and working in collaboration with local partners." "Elion has always been committed to a better environment, that's why we devote ourselves into combating desertification and addressing climate change." Mr. Liu Jiang Tao, Director of Elion said, "The launch of China's carbon market provides additional support to our existing business in ecological industry and clean energy, and we will further explore the practices in green finance." Elion Group ("Elion") was founded in 1988 in the Inner Mongolia Kubuqi Desert. Committed to preventing land degradation and transforming desert back to cities, Elion has developed Kubuqi Model to restore the ecology of Kubuqi Desert. The achievement of Elion has been recognized by UNEP and UNCCD and now it is broadening its business to other environmentally related areas. Further information about Elion is available on www.elion.com.cn. BP is committed to a lower carbon future and published the report, Advancing the Energy Transition in April, which details BP's framework for delivering this commitment: reducing greenhouse gas emissions in its operations, improving its products to help customers reduce their emissions, and creating low carbon businesses.